Published in the South Kent Gazette, 29 August, 1979. The houses on the western side of the street were set back, and a regular line of frontage, noble in appearance, was formed, four of the shops being embellished by fluted pillars. One of these, No. 4 was, soon after the widening in 1826, a watchmaker’s — Mummery’s — and such a business was continued there by Mr. John Bacon until his death in 1914, when the Labour Exchange moved down to King Street from London Road. There have been a good many changes in King Street establishments since the period of widening, including the opening, on the western side, of two banks, both now gone. The Capital and Counties Bank, for which premises were built at the corner of Queen Street, amalgamated with Lloyds, in the Market Square. The greatest change on the eastern side was the demolition of the “Flying Horse Inn“, and the erection in 1893 of a General Post Office to replace the old one in Northampton Street. It had, however, no accommodation for the motor vehicles of 20th century use, and this Head Post Office was in turn superseded by new premises in Biggin Street. When they were completed, in 1915, the King Street building was vacated. During the Kaiser war it was used by the Dover Patrol, and in 1921 became the Employment Exchange. Bench Street was a part of old Snargate Ward, but it did not become important as a thoroughfare until the Western Harbour works in the Tudor period reclaimed the land now forming Snargate Street and the Pier district. Across the end of it ran the town wall, through which was a strong gate, called Boldware, otherwise Severus Gate, and over which was the office of the King’s Customer. In the Tudor period the whole length of the thoroughfare from the sea to the Market Place was called King Street, or the King’s Highway. The space at the junction of Snargate Street, Bench Street and Townwall Street was called "The Bench,“ there having been adjoining this gate a pavement where merchants of various sorts assembled to do business. Here was transacted all the marketing except the sale of fish, which was carried on at the adjoining fish market near the side of the river, until about the year 1480, when the Corporation established the present Market Place. The commerce of the town then left “The Bench,“ and, instead of being used for business, it was the resort of loungers and gossipers, and in derision it was called “The Pennyless Bench.“ However, as late as 1696 orders of the Court of Lodemanage (Pilots) stated that members of the Court should meet at the Bench in Dover between 11 and 12 noon for the expeditious dispatch of business. When Bench was adopted as the name of the street it is difficult to determine. It was not a very important thoroughfare prior to 1836, for opposite the “Shakespeare Hotel“ it was but 18ft. wide. It had on the east side of it a strong tower and the remains of an ancient building, which rendered widening difficult. The tower and the ancient building in Bench Street have given rise to a good deal of historical dispute. Mr. Hasted, the Rev. John Lyon, and other writers who have copied from them, have stated that this tower was a part of St. Nicholas Church. The late Rev. Canon Scott Robertson, in a paper read to the Kent Archaeological Society, in 1892, contended that there never was a St. Nicholas’ Church as a separate building, St. Nicholas and St. John having been separate rectories but having altars under the roof of St. Martin-le-Grand. The fact remains that, whatever it was, there was in Bench Street, in 1836, a building with a perfect crypt and tower. It is unfortunate that it seems to have been necessary to destroy entirely the ancient structure to prepare the foundations of modem shops erected in 1837; but when the road was opened for laying the tramline, about 1895, massive masonry was found about the middle of the road opposite the old “Shakespeare,“ and there it remains. There have been traces of ancient foundations and arches found on both sides of Bench Street — in the cellars of the "Shakespeare Hotel“, later the "Crypt Restaurant" and beneath shops on the other side of the road at Nos. 15 and 16. In the rebuilding of the corner shop called, in 1836, “Corbett’s Corner,“ and for many years afterwards Williamson’s Fancy Repository, there was found a curious Gothic window, which was afterwards built into a grotto at Kearsney Abbey. “Each side of the tower measured 22ft. The walls were four feet thick, and so immensely hard that it required a constant labour of several men more than three weeks with wedges, sledge hammers, and gunpowder to demolish the structure to a level of the pavement. Parts of it to a depth of eight feet below the pavement were dug out to complete the foundations for the new houses, and some portions of it remain under the street. A combination of curiously spreading arches tending to a centre from the sides and angles supported a floor of the tower about 20ft. above the present surface. Another floor 20ft. higher was supported by similar arches. The latter formed the covering to the tower, and had on it a thick layer of cement. A flight of spiral stone steps, much worn, ascended in the northern angle to the top. Whether it was ever more than 40ft. high is uncertain. The same writer further adds that an arched undercroft extended 102ft. from the tower northward, and about 50ft. southward. 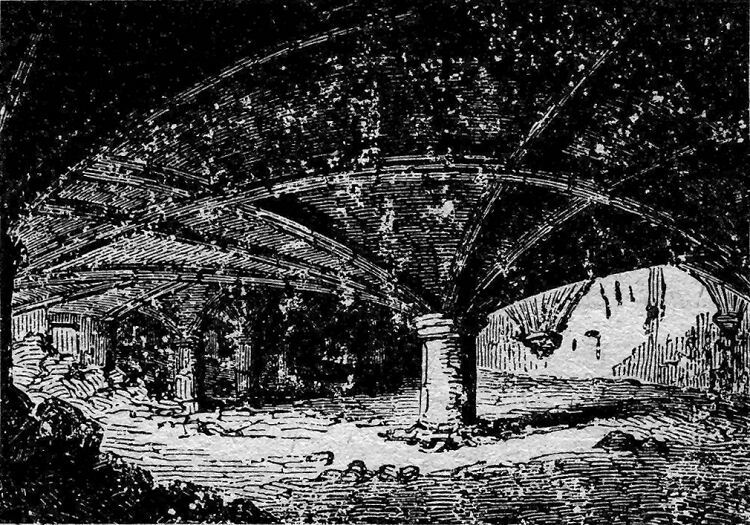 This undercroft was curiously arched, and laid on a bed of hard light coloured sand. The old porch over the main entrance and the portcullis were taken down in the year 1796. If Canon Scott Robertson’s view is correct, it is left to conjecture what this old Bench Street edifice was. Evidently the tower was but a small part of the superstructure which the underlying crypt sustained. The great church of St. Martin’s-le-Grand being within a stone’s throw, the supposition that this was another great church seems to be quite out of the question. Some have suggested that it was the ancient “Gilhalla“ of the burgesses, spoken of in the Domesday Book; but it would be more probable that the extensive structure supported by this groined undercroft was the marine frontage of the great monastery of St. Martin-le-Grand, rebuilt after the fire that took place at the Conquest, and that the tower was its seaward place of defence. 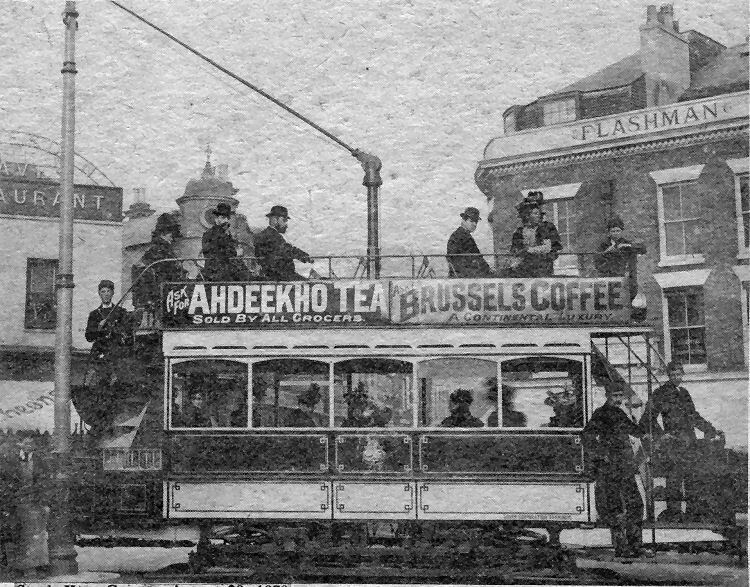 THE driving of Dover’s first official tram by the Mayor on 6th September, 1897, marked the opening not only of Dover Corporation’s tramway system, which continued in use until 1936, but of the first electric tramway in the south of England. Here the first tram with VIPs on board is pictured at the Castle Street comer of the Market Square, with Igglesden and Graves, the bakers, on one side and Flashman’s, the furnishers, on the other.